Released in 2015, Bolivar cigars introduced a new and exciting line to its already famed cigar brand. Bolivar Heritage are hand-rolled premium cigars individually made in the Dominican Republic. Every Bolivar Heritage is crafted using an Ecuadorian Sumatra for the binders accompanied by a five-nation tobacco blend of Nicaraguan, Honduran, Mexican, and Dominican long-filler tobaccos. What makes these handmade premium cigars so unique is the silky dark brown Connecticut Habano wrapper that holds all this high quality elegant tobacco together. 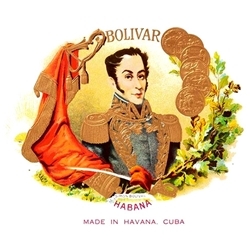 Bolivar Heritage premium cigars are medium to full-bodied, offering an aromatic smoke with unique complexities of flavors that come together in fine harmony from start to finish. If you looking for a great smoke at a great price, Bolivar Heritage are hand-rolled premium cigars that deliver time and time again. Smokers Discounts has made it affordable and easy to buy cigars online. Every product can be delivered right to your front doorstep. A variety of sizes and flavors are listed below in our online cigar store. Each of these styles are in stock and available for a low discount price! Call us for more details!